Clump forming plant with tall strong interesting leaves and white flowers in spring. The root is grated and made into a hot piquant sauce for meat.Medicinal uses. Perennial. H:10cm H:10cm. 12cm, 17cm. • Dies back completely in winter, new growth in spring. 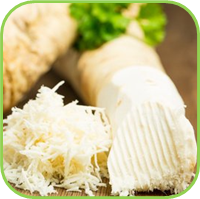 • To store the harvest, the roots can be frozen for up to 6 months, made into horseradish sauce or pickled in vinegar. • Vegetables: Plant with Potatoes. 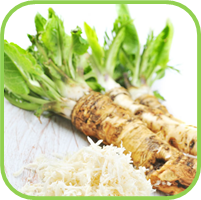 • Horseradish sauces may be gently warmed, but cooking destroys the volatile oils resonsible for the pungency. 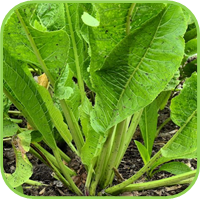 • Leaf: Chop finely into dog food to dispel worms and improve body tone. • Stimulates the digestive process whilst easing wind and griping pains. • 1 teaspoon grated fresh root in each cup boiling water, infuse for 20 minutes. Half-1 cup in sips, freely. • 25g scraped fresh root to 500ml cider vinegar. 1-2 teaspoons in water for catarrh, sinusitis, poor circulation or as a male tonic. • Avoid continuous large doses when pregnant or suffering from kidney problems. • Cucumber beetle, Potato beetle.